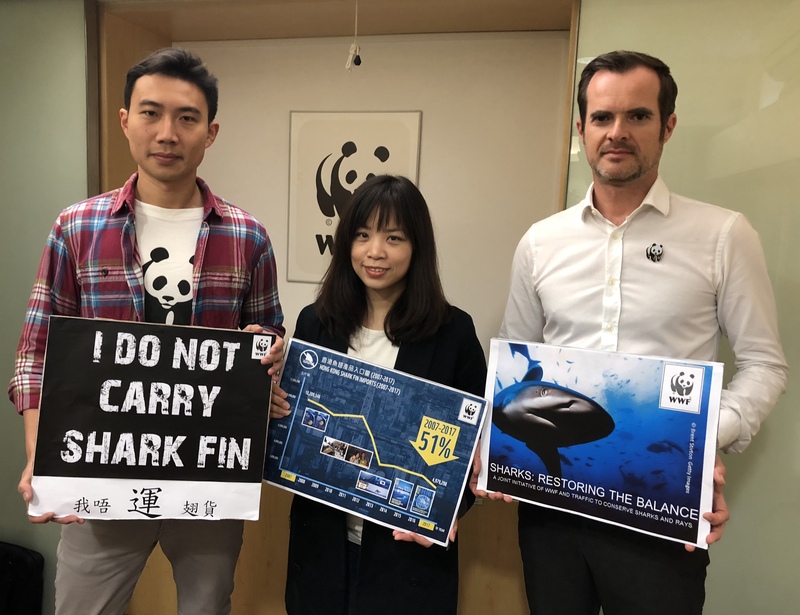 WWF-Hong Kong’s decade long call for the public to stop eating shark fin, and for shipping companies to stop shark fin carriage, is showing promising results. The volume of shark fin imported into Hong Kong has declined from 10,210 tonnes in 2007 to 4,979 tonnes in 2017, a drop of over 50 per cent, according to latest figures from the Census and Statistics Department. The import decline is due both to a decline in the shark fin passing through Hong Kong and the amount consumed here (re-exports dropped 75 per cent over the decade while the amount retained declined 22 per cent). “The actions of WWF and others to reduce shark fin consumption and introduce airline and shipping bans has had a real impact. There’s more good news with container shipping line X-Press Feeders just announcing a ban on shark fin carriage this month. We are now working towards making Hong Kong a shark fin free zone in the next decade or less,” Tracy Tsang, WWF-Hong Kong’s senior programme officer for Oceans Sustainability said. Looking at the trade data, the first major drop in imports occurred in 2011 to 2012. The second change took place in 2012 to 2013. The latest drop was in second half year of 2017. The percentage of volume imported by sea also decreased slightly, from 90 per cent in 2016 to 86 per cent in 2017. With its first bilingual shark conservation leaflet released in 2007, WWF-Hong Kong engaged corporations to make a no shark fin pledge and commit to not promote trade or consume shark fin. The notable declines in shark volumes coincide with the publication of WWF-Hong Kong’s No Shark Fin Carriage Policy – Implementation Guidelines in August 2017 and earlier with the launch of its “alternative shark-free menu” in 2010 and “no shark fin individual pledge” in 2012. Since 2015, WWF-Hong Kong focused its work on the global shipping companies. The latest figures indicate that the campaign may be helping shipping companies to implement their no shark fin carriage policies. Whilst imports have remained flat at over 5,400 to 5,700 tonnes since 2013, the number fell below the 5,000-tonne mark in 2017, declining 13 per cent from 2016. And import volumes transported by sea decreased from 5,197 tonnes in 2016 to 4,275 tonnes, in 2017. The listing of nine commercially important shark species onto Appendix II of the Convention on International Trade in Endangered Species of Wild Fauna and Flora (CITES) since 2014 will also reduce the volumes traded internationally, including through Hong Kong. A declining market for shark fin in China will also have contributed to reduced re-exports from Hong Kong. Around one quarter of the world’s shark and related species are threatened with extinction. Of 465 species, globally international trade is allowed, with strict restrictions for just 12 species and efforts continue to stem any illegal trade. “Illegally importing shark fin should be a serious crime with tougher penalties. The risks of trading in any fin products should be a strong incentive to all shipping companies to get out of the trade in shark fin where supply chain authenticity is often unclear,” Tracy added. WWF urges the remaining shipping companies, to establish a No Shark Fin Carriage Policy. As a community, Hong Kongers, caterers and corporations continue to SAY NO to shark fin. We support effective action by Hong Kong law enforcement agencies to take action on illegal wildlife trade. By working together, we aim to secure a brighter future for shark species and ensure healthier oceans in our lifetime. Evergreen Line accepts shark fin shipments with a CITES permit. Shipping companies that operate liner route between Hong Kong and key shark fin trading partners.